We’d love your help. Let us know what’s wrong with this preview of Any Questions? by Marie-Louise Gay. To ask other readers questions about Any Questions?, please sign up. Be the first to ask a question about Any Questions? Where do stories come from? How are books made? These questions that authors often get from children are the subject of this picture book from an author who has written and illustrated many picture books. Together the author and a group of children asking delighted questions create a story right in front of the reader. They take inspiration from the kind of paper the story is written on, the colors of the page. They talk about how ideas happen, and how sometimes they are great ideas but don’t be Where do stories come from? How are books made? These questions that authors often get from children are the subject of this picture book from an author who has written and illustrated many picture books. Together the author and a group of children asking delighted questions create a story right in front of the reader. They take inspiration from the kind of paper the story is written on, the colors of the page. They talk about how ideas happen, and how sometimes they are great ideas but don’t become a book or that not all ideas fit into a single story. Ideas sometimes don’t appear and you have to wait for them, doodling and dreaming of other things until they arrive. And then something happens, and it starts to become a story! The children in the book get involved and the story takes a surprising turn. Luckily story telling is flexible and able to deal with wild purple monsters who come out of the woods. This is a great look at the creative process and how books are made, written at a level that preschool children will enjoy and understand. Gay is so open and inviting in this picture book. She is refreshingly candid about the creative process and all of the bumps and twists along the way. The invitation to the reader along with the child characters in the book to be part of creating a story is warm and friendly. All ideas are welcome, some work and other don’t, and that is all embraced as part of creativity. Gay’s illustrations continue the cheerfulness of the text. They combine writing in cursive with story panels and speech bubbles with characters in the book. It’s all a wonderful mix of styles that gets your creativity flowing. Expect children to want to write their own stories complete with illustrations after reading this! Appropriate for ages 5-7. I wish there were just more stars here; I would have given the most.. I think this is the best picturebook I've ever read. The book is interactive and amazing. Lots of details and cute illustrations. Am sure you'll definitely fall in love with the cat. This can be a very good example for a metafiction in picturebooks and really suitable for young readers. Inspired by the many questions about literally everything under the sun that this author has been asked by children when she visits schools to talk about her books, this book takes those children's questions and walks them through the process of brainstorming and developing a book. The voice is informative as well as encouraging and would be a great tie-in for a creative writing assignment in schools or a writing program in libraries. Watercolor, ink, pencil, pastel, colored pencil, and collage i Inspired by the many questions about literally everything under the sun that this author has been asked by children when she visits schools to talk about her books, this book takes those children's questions and walks them through the process of brainstorming and developing a book. This book would be a great starter for teachers to use to inspire ideas for writing. An inviting story that shows students how authors generate ideas and flow with them, as well as give youngsters ideas to use in their own writings. Okay, so I skimmed this because it seemed self indulgent and it was long and I wasn't in the mood for that. I'll return to it if I ever need a picture book about the creative process. The author states that sometime they draw a blank too. Sometimes she asks questions, sometimes she draws or doodles--- and then the story starts. She had beautiful illustration to go with her story on how she comes up with ideas for stories. Very beautifully done! Warning: Some of the text is in cursive. If the young kids are reading it, you need to be aware. Amusing, curious children with many, many questions. I found reading it a little confusing as my attention was drawn in many directions at once. Just like all these children yelling questions at once. Little ones may like all the details; however, it was too much for me. Another Marie-Louise Gay book to love and share! The storyline that involves the kids helping to develop the plot was great. Liked the recurring characters that keep reappearing in all her books. Who couldn't love sophisticated snails! Probably couldn't do this as a read aloud, but still a great book. The pictures were beautiful. This was interesting, and interactive. The kids enjoyed it. A longer read. It was interesting. I loved the kitty. This is a truly magical book teaching folks on how to write, how to create, and what to do along the process in the most cleverest of ways!! very interesting way to write a book, 3.5yr nephew really enjoyed it and the bubble dialogue. Cute book about creative writing. I would use with third grade since some of the pages are in cursive, which younger children would not be able to pick out words from. Ya les había contado que mi hija quiere ser Ilustradora para crear sus propios libros??? Pues este libro es perfecto pra ella. Many children want to know where stories come from and how a book is made. Marie-Louise Gay's new picture book provides them with some delightfully inspiring answers though a fictional encounter between an author and some very curious children -- together they collaborate on writing and illustrating a story. Marie-Louise Gay has scribbled, sketched, scrawled, doodled, penciled, collaged, and painted the words and pictures of a story-within-a-story that show how brilliant ideas creep up on you wh Many children want to know where stories come from and how a book is made. Marie-Louise Gay's new picture book provides them with some delightfully inspiring answers though a fictional encounter between an author and some very curious children -- together they collaborate on writing and illustrating a story. Marie-Louise Gay has scribbled, sketched, scrawled, doodled, penciled, collaged, and painted the words and pictures of a story-within-a-story that show how brilliant ideas creep up on you when you least expect it and how words sometimes float out of nowhere, asking to be written. Any Questions? presents a world inhabited by lost polar bears, soaring pterodactyls, talking trees, and spotted snails, with cameo appearances by some of the author's favorite characters -- a world where kids become part of the story and let their imaginations run wild, becoming inspired to create tales of their own. 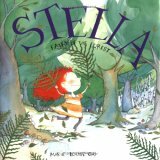 At the end of the book, she provides answers to many of the questions children have asked her over the years, such as "Are you Stella?," "How did you learn to draw?," "Can your cat fly?," and "How many books do you make in one day?" I really liked this book! The illustrations were great - and the writing was wonderfully imagination provoking. The book started out with questions that the author has received from kids (she provides answers to all of them in the back of the book) and the proceeded to tackle the questions dealing with her writing/illustrating process. She provides insight into her creative process, while giving the reader the opportunity to participate in the creative process. She talks about how she doesn't al I really liked this book! The illustrations were great - and the writing was wonderfully imagination provoking. The book started out with questions that the author has received from kids (she provides answers to all of them in the back of the book) and the proceeded to tackle the questions dealing with her writing/illustrating process. She provides insight into her creative process, while giving the reader the opportunity to participate in the creative process. She talks about how she doesn't always have an idea at the beginning and sometimes gets stuck - and lets kids know that this is okay. I absolutely loved the page on which she depicts children playing in a big pile of words. How cool is that? It makes me want to find a bunch of words and jump into the pile - picking out my favorites. Marie-Louise Gay begins by talking about how she had many questions as a child. Then she talks about how children ask her many questions now. She then moves on to her writing process. She talks about how she begins with possible stories and then rewrites or starts over as needed. She includes a story within this story as she shows her writing process. The illustrations are done in a mix of watercolor, pencil, pastel, ink, colored pencil and collage. They are colorful and interesting, but terrible Marie-Louise Gay begins by talking about how she had many questions as a child. Then she talks about how children ask her many questions now. She then moves on to her writing process. She talks about how she begins with possible stories and then rewrites or starts over as needed. She includes a story within this story as she shows her writing process. The illustrations are done in a mix of watercolor, pencil, pastel, ink, colored pencil and collage. They are colorful and interesting, but terrible busy. I loved this book. It's amazing. It's incredibly imaginative, with beautiful drawings. It's one of my favourites. Some of the most wonderful discoveries and inventions have been made because a single person wanted to know a little or a lot more. When a group of people are looking for a response to a query, change is in the wind. In working with children you are surrounded by questions all day long. Their thirst for needing to know is nearly unquenchable. Sometimes they need to understand the tiniest detail about a particular subject. Other times their thoughtful thinking leads to discussions about problems o Some of the most wonderful discoveries and inventions have been made because a single person wanted to know a little or a lot more. When a group of people are looking for a response to a query, change is in the wind. In working with children you are surrounded by questions all day long. Their thirst for needing to know is nearly unquenchable. Sometimes they need to understand the tiniest detail about a particular subject. Other times their thoughtful thinking leads to discussions about problems on a global scale. Seeking answers is like the best kind of treasure hunt. 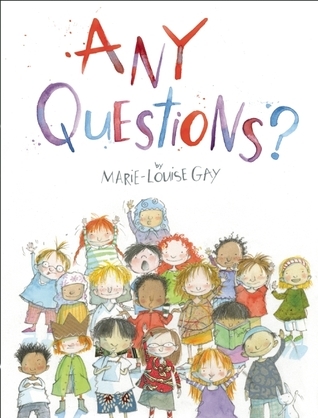 Author illustrator Marie-Louise Gay meets many children with many questions. Her new book, Any Questions? (Groundwood Books, House of Anansi Press, August 11, 2014, October 13, 2014), addresses questions, answers, and the use of imagination. There really is no end; only a continuation of beginnings. It's a story-in-a-story. 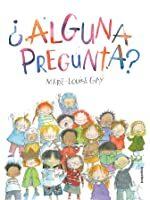 Gay illustrates all of these kids asking her questions (just like they do in real life) and takes them on the journey of writing a picture book. So, that being said, it is a little more complicated than your average book, meaning the target age is a little older. It's also harder to read aloud, because there's a LOT of speech bubbles and asides and...there's just a lot on every page. Gay's got a lot of ideas to share! Overall, it's a pretty valuable insight into how one a It's a story-in-a-story. Gay illustrates all of these kids asking her questions (just like they do in real life) and takes them on the journey of writing a picture book. So, that being said, it is a little more complicated than your average book, meaning the target age is a little older. It's also harder to read aloud, because there's a LOT of speech bubbles and asides and...there's just a lot on every page. Gay's got a lot of ideas to share! A fairly well-known author and illustrator talking about where she gets her ideas and the process she goes through when writing a story, which is really cool. I think kids would like to understand where the stories their parents read to them come from. It invites children to write their own stories. I love the quirky illustrations and the story within a story. It's well written. It's interesting. It definitely held my attention. It might be a little too A well-written story about writing stories. A fairly well-known author and illustrator talking about where she gets her ideas and the process she goes through when writing a story, which is really cool. I think kids would like to understand where the stories their parents read to them come from. It invites children to write their own stories. I love the quirky illustrations and the story within a story. It's well written. It's interesting. It definitely held my attention. It might be a little too long for littler kids, but as kids get older and start coming up with their own ideas, I think it would be inspiring to them. I definitely found it inspiring. Message: How to write a story. Or, anybody can write a story. Ok, here's what it looks like: She begins by illustrating a bunch of kids as if she's visiting a school. She recreates many of their questions. She takes one of the questions she gets most often "where does a story start?" and takes the children on a story writing journey. The kids experience her creative process and help develop her new story. It's kinda neat, but could be confusing to some readers. This is a marvellous book that was inspired by all the questions Marie-Louise Gay was asked by students. It explores how stories are made, the thoughts and ideas that go into making them, and inspires readers to make their own stories. I'm a bit torn about recommending this for our K1 Stories unit, as while the subject matter is perfect, the language and content is a little complex. Great for slightly older readers though, or to read together at home and share ideas. Marie-Louise Gay is the illustrator of many award-winning children's books. She is from Montreal, Canada.